We can learn a lot about the human brain by studying the nervous systems of other animals. Plus, sometimes researchers discover things that are just plain weird! Enjoy this collection of tidbits about animal brains. Remember photosynthesis: How plants capture energy from the sun. Chloroplasts (the green parts of leaves) are where the sun’s energy is captured. Andrew, Elise. “These Cute Sea Slugs Are The Sheep Of The Sea.” IFLScience, IFLScience, 15 Aug. 2016, www.iflscience.com/plants-and-animals/these-cute-sea-slugs-are-sheep-sea/. Händeler, Katharina, et al. “Functional chloroplasts in metazoan cells – a unique evolutionary strategy in animal life.” Frontiers in Zoology, vol. 6, no. 1, 2009, p. 28., doi:10.1186/1742-9994-6-28. Marine mammals, such as dolphins, whales, and porpoises, spend their entire lives at sea. Like us, they need to breathe, avoid danger, and care for their young. Like us, they need to sleep, which — for us — involves almost total unconsciousness and paralysis. So how do these marine mammals not drown when they sleep? Different species use different strategies, but bottlenose dolphins use an especially interesting one: they sleep with only one half of their brain at a time! The other half of the brain stays awake in order to watch out for predators, avoid obstacles, and signal to the dolphin to rise to the surface to breathe. This ability to sleep with half a brain is particularly important for new dolphin mothers. A newly born calf doesn’t float very well and can’t swim for long periods of time, so its mother must continue to swim for the first few weeks of her calf’s life to keep it afloat. Her ability to stay awake is critical to keep both her and her calf from drowning! Brain damage is a major concern for us humans – car accidents, football, falling backwards. It’s pretty easy to cause a concussion. 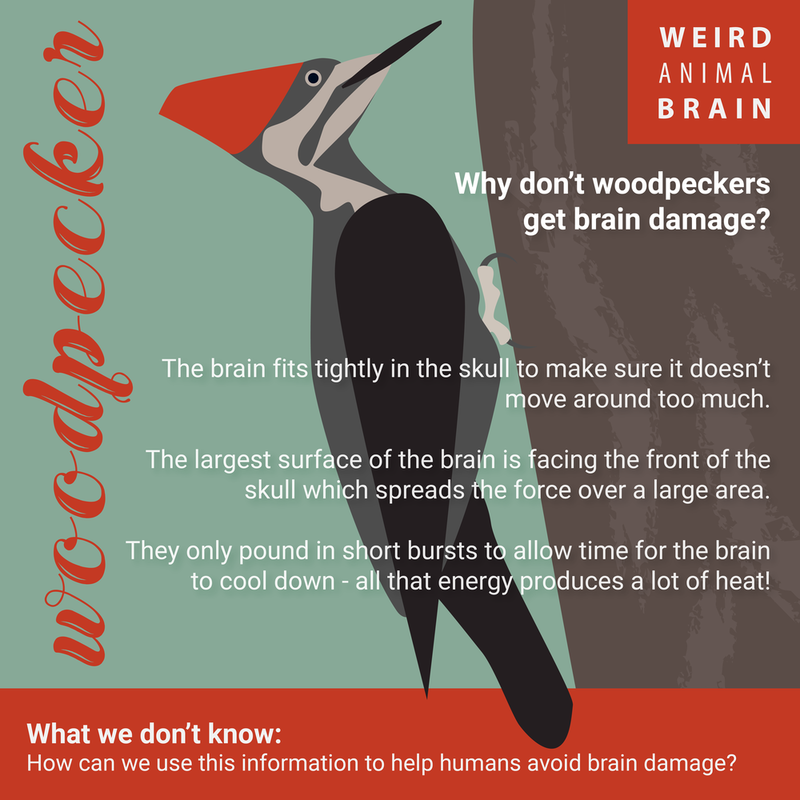 Woodpeckers, however, pound away daily using much more force than would cause brain damage for us. How are they able to protect their little noggins? The tuatara lizard is called a “living fossil” because it is the last surviving member of the Rhynchocephalia order. Learn more about the tuatara in the infographic below! Ung, C. Y., & Molteno, A. C. (2004). An enigmatic eye: the histology of the tuatara pineal complex. Clinical and Experimental Opthalmology, 32(6), 614-618. Fly lips are called labellum and fly feet are called tarsi. Both the labellum and tarsi contain taste receptors which help the fly find food. Think about that the next time a fly lands on your donut! Butterflies also have taste receptors on their feet, but only use them to avoid poisonous plants. "This effect is equivalent to the intensity of the voltage gradient that would be produced in the sea by connecting up a 1.5-volt AA battery with one pole dipped in the Long Island Sound and the other pole in the waters off Jacksonville, Fla. Theoretically, a shark swimming between these points could easily tell when the battery was switched on or off. 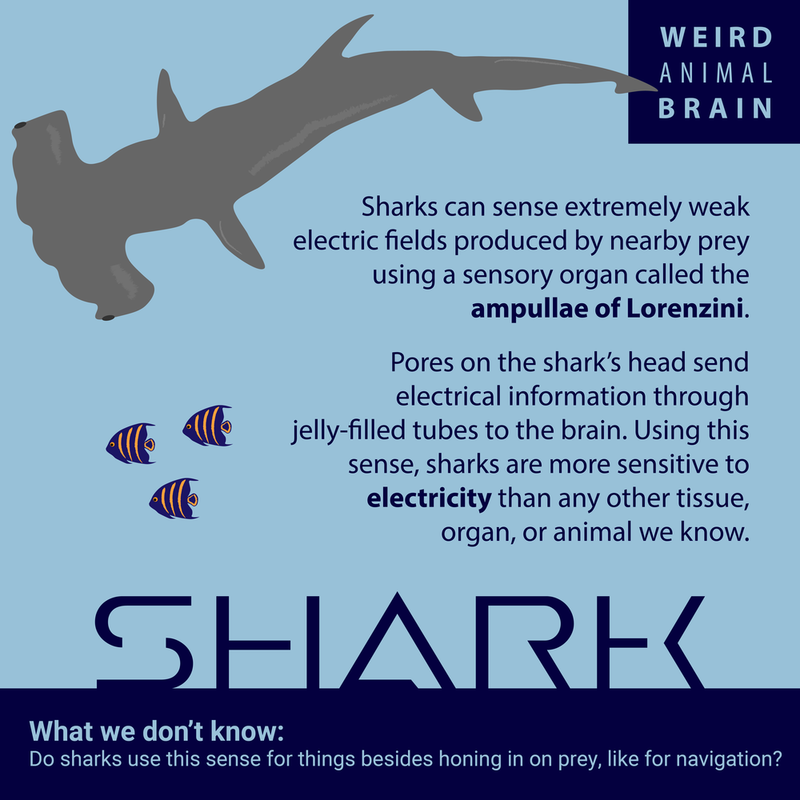 (Later measurements of brain response indicate that sharks can discern 15 billionths of a volt.) No other tissue, organ or animal exhibits such extreme sensitivity to electricity. Indeed, engineers have difficulty measuring such weak fields in sea-water using modern equipment." The brain is one of the most complex and amazing structures in the universe. It allows us to experience the world, feel, remember, and plan for the future. But for at least one organism, the brain is only a means to an end. Learn more in the infographic below! Karaiskou, A., Swalla, B. J., Sasakura, Y., & Chambon, J. (2014). “Metamorphosis in solitary ascidians.” Genesis,53(1), 34-47. Mehra, Rohan. “Autocannibalism is when you eat bits of your own body.” BBC. 13 Dec. 2016. Web. Last month, on the big island of Hawaii, I swam with giant, beautiful aliens. Or at least that’s what it felt like. I went night snorkeling with manta rays and had the privilege of seeing 10 or 11 graceful behemoths. Some had a wingspan of over 10 feet long. Before our group got in the water, to prepare us for what we were about to see, our guide reassured us that manta rays are like sharks, but only the good parts, none of the scary parts. They don’t have teeth, they only eat plankton, and they have no stinger like their sting ray counterparts. 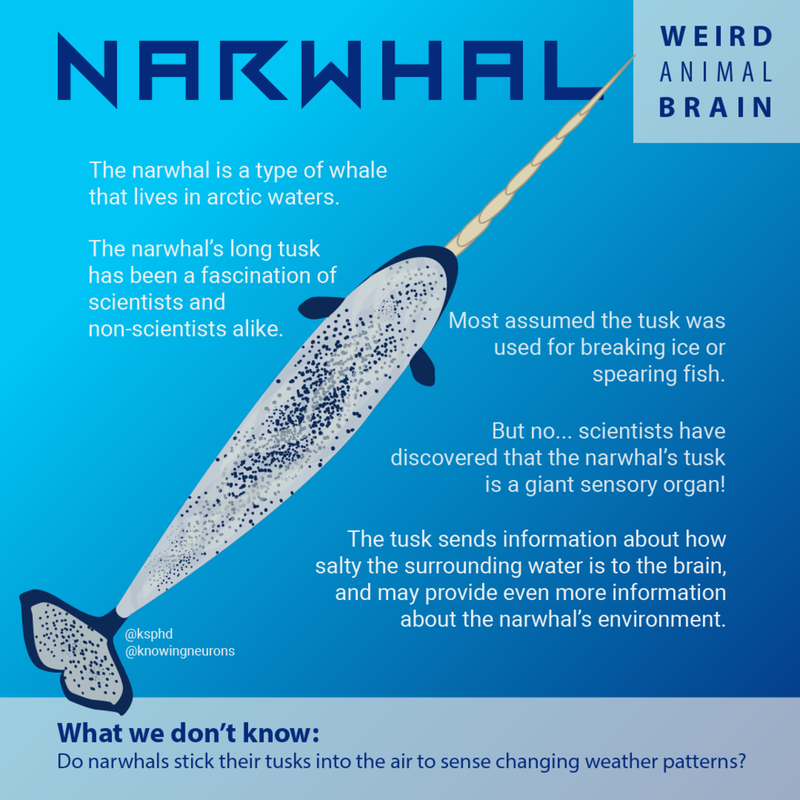 In addition to these unique characteristics, they also have a special mechanism to allow for a big brain to function deep in the ocean. Manta rays have the largest brain-to-body ratio of all the elasmobranchii (sharks, rays, and skates). TED Ed: Why are sharks so awesome? The jewel wasp’s venom is potent on two levels. With the first stab of its stinger, the wasp paralyzes the much larger cockroach. The neurotransmitter GABA, inserted into the thorax of the cockroach, causes temporary paralysis by shutting down motor neurons. The paralysis allows for the second stab — a perfectly targeted attack on a specific area of the cockroach brain (the subesophageal and supraesophageal ganglion). Scientists think a dopamine-like compound in the venom causes the careful cleaning behavior, while the GABA again works to shut down neurons, to ensure the cockroach doesn’t run away. This guarantees it will be there waiting to be eaten alive by the wasp’s offspring. That’s a pretty horrific way to die!